Richard L. Cruess, MD, is Professor of Orthopedic Surgery and a Core Member of the Centre for Medical Education at McGill University in Montreal, Quebec. He served as Chair of Orthopedics (1976–1981) and Dean of the Faculty of Medicine at McGill University from 1981–1995. He was President of the Canadian Orthopedic Association (1977–1978), the American Orthopedic Research Society (1975–1976), and the Association of Canadian Medical Colleges (1992–1994). He is a Companion of The Order of Canada and of L’Ordre National du Québec. Sylvia R. Cruess, MD, is an Endocrinologist, Professor of Medicine, and a Member of the Centre for Medical Education at McGill University. She previously served as Director of the Metabolic Day Centre (196–-1978) and as Medical Director of the Royal Victoria Hospital (1978–1995) in Montreal. She was a Member of the Deschamps Commission on Conduct of Research on Humans in Establishments. She is an Officer of the Order of Canada. 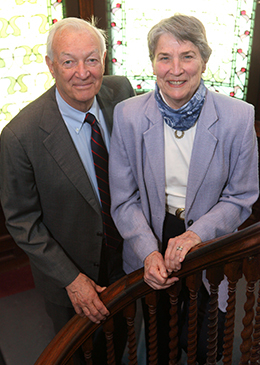 McGill University has established the Richard and Sylvia Cruess Chair in Medical Education. Since 1995, the Drs. Cruess have taught and carried out independent research on professionalism in medicine. They have published widely on the subject and have been invited speakers at universities, hospitals, and professional organizations throughout the world. “As subject matter experts for the Physician Charter, we were asked to comment on the unfolding of what has been termed the ‘Professionalism Project’ of organized medicine, the objective of which has been to make the issue of professionalism explicit for medical students, residents and practising physicians. The American Board of Internal Medicine, the ABIM Foundation and the American College of Physicians have, of course, been pioneers in this area, having begun their study of professionalism in the early nineteen-nineties. Our personal journey began in 1995 when we gave up our administrative jobs—one of us is an ex-academic orthopedic surgeon who served as Dean of Medicine at McGill University for many years and the other is an endocrinologist who was Medical Director of what was at the time McGill’s largest teaching hospital. We spent a sabbatical year studying professionalism and discovered that the bulk of the literature on the subject was in the social sciences area and that virtually nothing had been written in journals readily accessible to physicians. In 1997, we published an article in Academic Medicine that brought this concept into medical literature. We and others had come to the conclusion that the transfer of the traditional values of the healer encompassed in the word ‘professionalism’ had never been explicitly taught and must now be considered a fundamental part of the formal curriculum at both the undergraduate and postgraduate levels. From then, literature began to appear in medicine that defined ‘medical professionalism’ and outlined methods by which it could be taught and assessed. A foundational part of this literature emerged with the publication of the Physician Charter in 2002. As the issues around professionalism became better understood, the concept that it must be taught took hold and the bodies that regulate undergraduate and postgraduate medical education established the teaching and assessment of professionalism as a requirement for certification. It became understood that professionalism, like any other subject to be taught, had a cognitive base that needed to be presented to learners. The Charter has served as this cognitive base for many institutions, outlining the duties and responsibilities of physicians as professionals. However, simply learning about professionalism has never been sufficient. Almost from the beginning of organized medicine’s efforts to ensure the ‘professionalism’ of its graduates, it was recognized that the value systems of medicine needed to be internalized and become a part of the persona of the practising physician. Thus, in addition to teaching about professionalism, virtually every program established opportunities to reflect on these issues, in hopes that, in so doing, the values and behaviours of the professional would be internalized. Until a very few years ago, this is where the issue stood: with professionalism established as a fundamental competency in virtually every undergraduate and postgraduate medical program. In part because of the difficulties of assessing something as subjective as professionalism, there was an emphasis on the demonstration of professional behaviours on the part of learners—an individual is deemed to be professional based on what he or she does. However, due in part to the emergence in medicine of literature on professional identity formation, questions arose as to whether what a person did was actually as important as who that person had become. Was professionalism something that somebody could turn on and off depending on the context, or was an individual a professional because the identity of the professional has merged with that individual’s personal identity? We and others have come to believe that the objective of medical education has always been to support individuals as they develop their professional identity and that the teaching of professionalism, rather than being an end in and of itself, was a means to that end. This viewpoint has been strengthened by the publication of the Carnegie Foundation study on Medical Education in 2010, which recommended that professional identity formation become a fundamental part of the curriculum. Conceptually, this approach is based upon ideas drawn from educational psychology that are well-known: Each individual begins to develop his or her identity at birth, and the process continues throughout their life, with major and fundamental changes occurring between late adolescence and early adulthood. This, of course, is the age range during which medical education at both the undergraduate and postgraduate levels takes place. One’s occupation is an important part of one’s identity, serving as a stabilizing force as one comes to accept the norms of the profession.